J. B. Ivey & Company was established on 18 Feb. 1900 as a partnership involving Joseph Benjamin Ivey, the principal owner and active head of the firm; his brother George Franks Ivey; and Rev. J. A. Bowles. The first store was located at 231 North Tryon Street in Charlotte and subsequently moved to various addresses on that street. 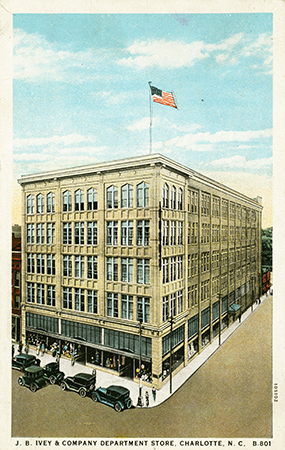 In 1935 Ivey's joined with Keith's, an established department store in Greenville, S.C., and this second store became known as the Ivey-Keith Company. In 1937 Ivey's, Inc., opened in Asheville. More stores followed in other locations in the Carolinas and Florida. Competition with two other Charlotte-based department stores, Belk and Efird's, was quite intense beginning in the 1920s, but by World War II Ivey's had an established reputation as a leader in high-quality merchandise. On more than one occasion, Joseph Ivey gave much credit for the firm's success to his associates. Among these were David Ovens, who joined Ivey's in 1905 and was second in authority until his death in 1957, and William T. Buice, who joined the firm in 1929 and was second vice president at the time of his death in 1951. Ivey and his associates introduced a one-price system (replacing the practice of selling goods for whatever the merchant could get) and installment buying (buying "on time"), for which customers were apparently willing to pay a small additional charge. Ivey's was sold to the Chicago-based Marshall Field department stores in 1980, which two years later was purchased by Batus, Inc., the U.S. subsidiary of the London-based B.A.T. Industries. On 4 June 1990 Dillard Department Stores, Inc., acquired the 23 Ivey's stores from Batus. LeGette Blythe and Charles R. Brockmann, Hornets' Nest: The Story of Charlotte and Mecklenburg County (1961). J. B. Ivey, My Memoirs (1940). "J. B. Ivey & Co." The E.S.C. Quarterly 7. No. 3-4. Summer-Fall 1949. p.94-95. http://digital.ncdcr.gov/u?/p249901coll22,451994 (accessed September 25, 2012). Swain, Steven. "The Ivey's Archive." Livemalls (blog). December 26, 2004. http://livemalls.blogspot.com/2004/12/iveys-archive.html (accessed September 25, 2012). 1 January 2006 | Williams, Wiley J.